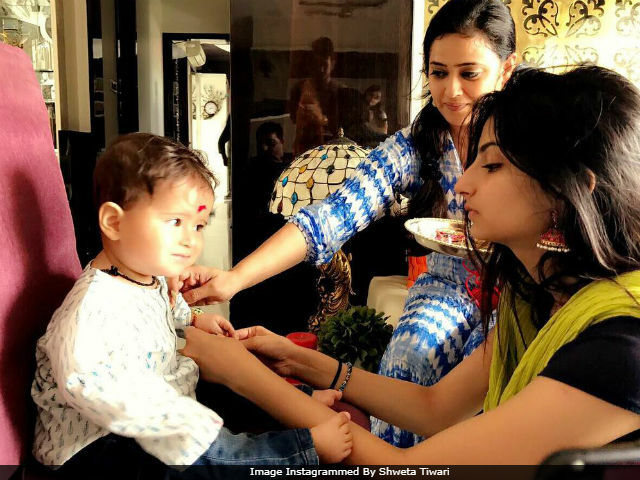 Like the Bollywood celebrities, television stars like Shweta Tiwari, Nisha Rawal, Divyanka Tripathi and others posted pictures from their Raksha Bandhan albums. This year's celebrations were special for Shweta Tiwari and Nisha Rawal, as it was their sons' first Rakhi. Shweta's son Reyansh was born last November. She is married to actor Abhinav Kohli and has a 16-year-old daughter Palak from her previous marriage. Shweta, 36, Instagrammed a cute picture of Palak, tying Rakhi to Reyansh. "After 16 years of falsely claiming my brothers, my daughter finally has her own little bodyguard, who loves her infinitely. Their bond is inexplicable in its own beautiful, delicate way. Seeing them love each other and grow fond of each other with every passing hour is a true boon, that I'm eternally grateful for," Shweta captioned her post. Palak, an aspiring actress, is reportedly prepping for her Bollywood debut. See the adorable picture which Shweta posted. Nisha Rawal, wife of actor Karan Mehra, posted multiple pictures from their son Kavish's first Rakhi. Kavish was born this year in June and is the couple's first child. "The Cutest Raksha Bandhan of my life & his first!!" read Nisha's caption. Karan and Nisha have been married for over five years. Karan is best-known for playing Naitik in Yeh Rishta Kya Kehlata Hai. After quitting the show, he featured in Bigg Boss 10. Meanwhile, Divyanka Tripathi Dahiya of Yeh Hai Mohabbatein, also gave a sneak peek into her Rakhi celebrations with brother Aishwarya. Divyanka Tripathi is married to her co-star Vivek Dahiya. The couple celebrated their first anniversary in July this year.